You may have seen my Twitpic over the weekend describing the grandma we had at our club event on Friday night, and my promise to put up a video. I have kept my promise! 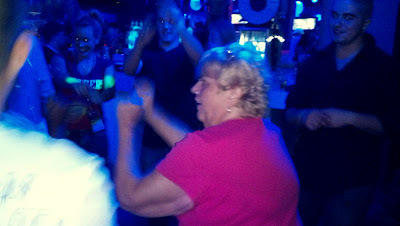 This grandma was taking shots, droppin' it like it's hot, and backin' it up on all the boys in the club. No, really... I'm not kidding. Some grannies know how to party, some don't. This one clearly did. She was with some younger ladies [by younger, I mean about 40-50 years old] who were all about her having the time of her life. No one cared I was videoing/taking pictures.. In fact: she high-fived me when she caught me! Bobby Hollywood kept calling her out on the mic, and she would just drop it even lower or shake it even faster. The finger in the mouth that moves down her shirt and into her cleavage: It happened. It. Was. Amazing. If only I hadn't forgotten my camera in my car this night, of all nights. Thank goodness my phone has a decent one.